Slice 2 large aubergines lengthways into about 10 slices each, and discard the 2 outside slices. Brush both sides of the slices with olive oil and cook on a hot barbecue or griddle pan for about 2 minutes on each side or until lightly coloured. Stack on a plate and cover with clingfilm. Place 1 deseeded and finely chopped red chilli in a bowl with 1 pack fresh mint, finely chopped, and the juice of 1 lemon. Season with freshly ground black pepper and mix well. Then stir in 300g crumbled Greek feta. 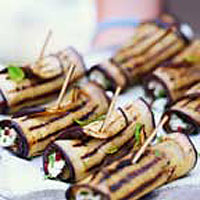 Place a spoonful of the feta mixture on each slice of aubergine, roll up and secure with a cocktail stick. Serve warm or at room temperature, garnished with 1/2 pack chopped fresh mint and drizzled with Greek olive oil.